Issues with "Foreplay/LongTime", "Train Kept A Rollin'", "Won't Be Fooled Again", and "Green Grass And High Tides"
So, as I read in a previous thread, a few songs from RB1 don't work after adding harmonies and keys. I'm told I can fix it via editing some stuff in the .dta file, but I'm too paranoid to just try it via process of elimination. Can someone help me and walk me through it? I'm just worried of messing it up. Thanks for the help everyone! Depack the song packages so the full-length and short versions are separate. The Quick Pack Editor in C3 CON Tools can do that for you. You should be able to upgrade the full-length songs without error then. Still not getting it entirely. I do hate to ask, but could you possibly give me a walk-through? Open C3 CON Tools (download it if you don't have it). Select Quick Pack Editor (middle left). Drag and drop the LIVE/CON file into the top white area. Once it's finished processing you should have the unpacked version of the song. Okay, I'm still not getting it. 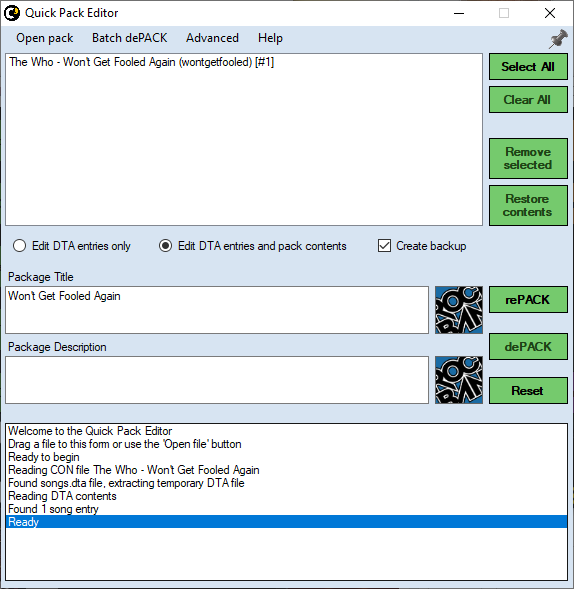 I get to the Quick Pack Editor and drag the file to the top but dePACK isn't an option (but Batch dePack is). It doesn't look like this? The dePACK option afaik is to separate songs from a CON pack. If you want to extract specific files (or replace) you need to drag the CON file into the main menu of C3 CON Tools.